Mangala-Meena-9 academic philosophy, theory, doctrine AND Chandra-5 politics receive double-expansion drishti of uttama-Guru-yuti-Rahu. Mr. Newton Leroy McPherson Gingrich offers the observer a bundle of contradictions. 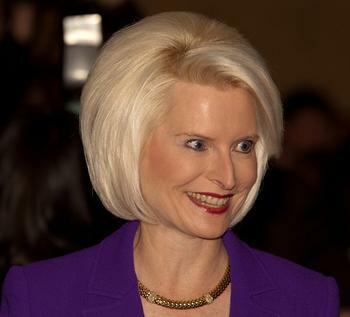 Gingrich seems to favor the Rahu-style Great Leap approach to life. 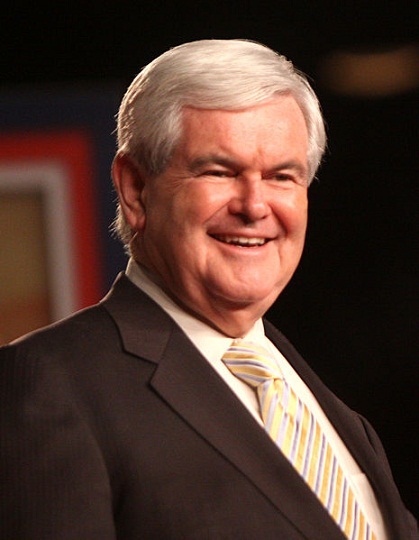 Gingrich's moral-emotional style is 'prophetic ' rather argumentative. Although he is a trained academic, the logic he deploys is less determined by the rules of reason than by the political psychology of 'spin'. Rahu-1 yuti Guru allows Gingrich to amplify what he believes to be true without accountability to any outside authority. The personality seems almost impossible to contain in an existing social category. There are some clues toward Narcissistic Personality Disorder but that ailment is very widespread amongst the super-competitive, super 'successful' aggressive and dehumanizing males of his generation, likely not a useful Jyotisha tag for him as an individual. 9th-from-Chandra : emotional response to doctrine. Mr. Gingrich undertook not one but two "religious conversions" switching from his received Protesting Christian confession at birth, to a new Protesting sect, and finally to the credo of Roman Catholicism. three graha in 9th-from-Chandra also suggests three fathers. Economically gainful Budha-11 rules Bhava-3 publications, meetings, conference, media-messaging, teamwork, collaboration, itineraries, reports, announcements. The primary source of his income is media publications. 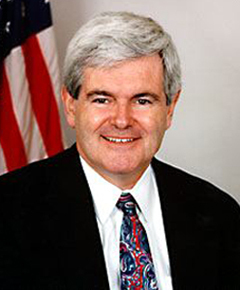 Although Mr. Gingrich has published almost no full-length books (except his doctoral dissertation in history) he is a hyper-productive fountain of short articles, book reviews, and opinion pieces. Counting his literary book reviews as well as published articles in a wide variety of venues and subjects, the total number of publications is hundreds or more. Because this remarkable cluster Rahu-Guru-Zukra does include kalatra-karaka Zukra and this is the nativity of a husband, three wives would be predicted in the order of their degree. All three of the life-partners have sibling qualities of bhava-3, which is particularly helpful and functional for a matrikaraka Chandra-7 nativity in which the primary relationship-partner is Mother. uttama * digbala Guru at 04 degrees represents wife-1, a high-school teacher and parent. Consistent with his Karkata radical lagna, wife-1 was 7 years his elder). Second spouse Zukra-17 degrees * bandesha-4 and vriddhipati-11 . Wife-2 is credited with helping Mr. Gingrich get his economic earnings in order (11) and provide a bhukti of home-based stability. Third wife Rahu-25 degrees amplifies Rahu's ruler Jyeztha-Chandra-5. The third lifepartnership explicitly supports politics and personal identity. Not a strong personal connection (scattered) with the step-father but Ketu's Professor Shani-11 is structured and achievement oriented. 11 offers a hospitable environment for Shani therefore the relationship is supportive albeit disciplined. Siblings, cousins, schoolmates, bandmates, team-mates, entourage, ensemble, neighbors, managers, cohort, coterie, collaborative group, publishers, messengers, merchants, scripts, and texts may be especially influential. Guided by instructors from Hydra. 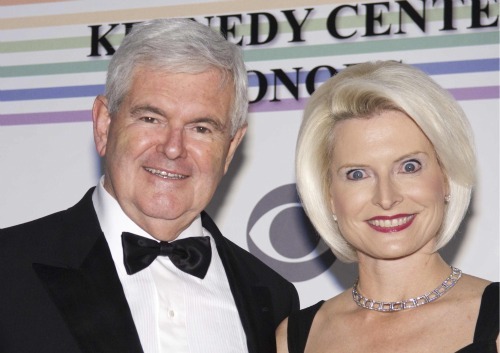 BPL note: the third Mrs. Gingrich's physical appearance is much assisted by the auspicious drishti of Makara-Zukra upon her Chandra and radical lagna. Shil-Ponde's implication of homeliness loses its severity under the harmonious, pleasing ray of Zukra.